17 Apr 2019 / 18:39 H.
PANGHSANG, MYANMAR: It has a standing army of 25,000, manufactures its own guns and conscripts at least one member of each household — meet the United Wa State Army: Communist, reclusive, China-backed rebels determined to protect their supremacy over Myanmar’s badland border zone. Thousands of soldiers, including a company of women and a sniper platoon in combat webbing, marched early Wednesday alongside armoured vehicles in Panghsang, capital of the ethnic Wa, which borders China’s Yunnan province. 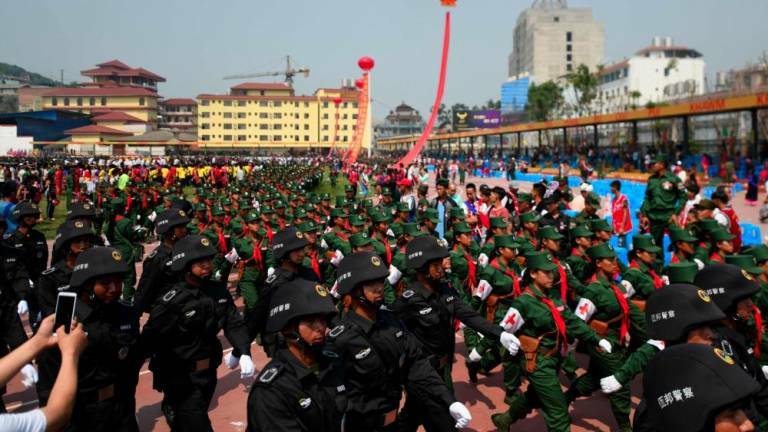 It was a show of force marking 30 years since Communist Wa rebels negotiated a ceasefire with Myanmar leading to the establishment of special, semi-autonomous zone, marshalled by Bao Youxiang, chief of one of the world’s largest non-state armies. This week the normally inscrutable Wa extended a rare invite to foreign media to their isolated territory to show off their military prowess and deliver a defiant message of self-sufficiency within Myanmar’s borders. “The Wa people are masters of their own destiny,“ Bao, flanked by senior Chinese officials, declared in an address to the thousands gathered for the parade. Fed by a ready supply of conscripts — some barely in their teens — China-armed and trained, the UWSA bears comparison to Lebanese Hezbollah in size. Also like Hezbollah they are clients of a larger state actor, who pulls strings for strategic ends. But the UWSA also taps a deep seam of local pride and enmity towards the central state, which is dominated by the Bamar ethnic group. Estimates vary, but experts put the UWSA strength at 25-30,000 regulars, backed up by a large, well-trained reserve. Wa forces dwarf the collage of other ethnic rebel groups operating across Myanmar, posing a deterrent to the country’s “Tatmadaw” army and gifting Beijing a useful bridgehead into its resource-rich neighbour. “We haven’t suffered fighting in decades and have developed over these 30 years,“ a UWSA officer told AFP, requesting anonymity. Once a Chinese enclave, the Wa became known by British colonisers as the “wild Wa” for their fearsome reputation for headhunting. Since becoming a special region, the zone has undergone an economic boom of sorts. It is home to one of the world’s largest tin mines and massive rubber plantations. Regional drug cops say it plays a central role in the “Golden Triangle” narcotics trade, forged over decades of opium production. The Wa have long been accused of running a narco-state peppered with meth labs across their self-policed lands — claims Wa leaders vehemently deny. “Poppy cultivation will never appear again,“ said Bao citing its eradication as one of his state’s “proudest achievements” and vowing to combat all drug production. But independent analysis is impossible. Wa remains virtually locked-off, resistant to outside visitors, ringed by checkpoints and tight internal controls. The publicity-shy septuagenarian Bao has helmed the region for decades. An unassailable, authoritarian figurehead, he presides over a political hierarchy that shadows the structures of big neighbour China and a tightly-controlled society. “In the mould of Xi Jinping, Bao is the head of the army, party and government and has been confirmed in those positions for life,“ Bangkok-based security analyst Anthony Davis told AFP. Zhao Guo An, a senior UWSA leader, lauded the relationship with China, telling reporters it was “very old, we’re brothers,“ adding Beijing “is very important” for his forces, but declining to give further details. As a trading gateway to China — the yuan is the Wa currency — the zone provides a point of leverage for Beijing against Myanmar and any potential resistance to its grand infrastructure and pipeline plans for the country. The Wa have attended peace talks in a country lacerated by ethic conflicts, but so far remain outside a nationwide ceasefire deal — an agreement keenly sought by Aung San Suu Kyi’s civilian government. Intense violence between Myanmar’s army and Rakhine rebels on the other side of the country has undercut prospects of a binding peace deal any time soon. “The UWSA is the largest non-state military actor in East Asia,“ Davis said, adding it “has unquestionably been armed by China” despite producing its own China-designed rifles. A barrage of colourful flares ended the parade as thousands of people in ethnic clothes joined the ranks of military in the sports ground — a show of loyalty in a highly militarised area. “I became Wa soldier when I was about 13 years old. My younger brother is also a soldier,“ a 32-year-old UWSA recruit told AFP, also requesting not to be named. File picture of a motorised canoe, also called a pirogue, which is widely used to transport people and goods in DR Congo. Accidents are common, often due to overloading.